While on tour with Def Leppard in Canada earlier this year, COLLEN wandered into the Six Hundred Four store in Vancouver. As an avid original sneaker fan, COLLEN never passes up an opportunity to check out unique ‘sneaks.’ Going thru the shop, which felt more like an art gallery than a shoe store, COLLEN was intrigued by the small batch artisanal kicks. After striking up a conversation with Six Hundred Four founder, James Lepp, a eureka moment occurred. Literally the next morning, with the help of renowned sneaker artist Zac Vine (@zeevycustoms), COLLEN splatter painted the first two pairs using the same signature paint style that appears on his sold-out, limited edition Jackson Splatter Guitar series. 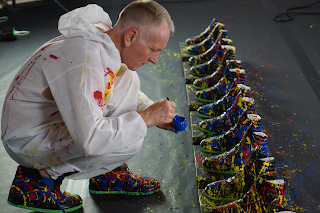 The significance of THIRTY pairs of custom shoes is not lost on COLLEN as this year, he celebrates the 30th Anniversary of Def Leppard‘s multi-platinum album HYSTERIA, his 30+ year relationship with Jackson Guitars as well as marking 30 years of sobriety for the health conscious guitarist. 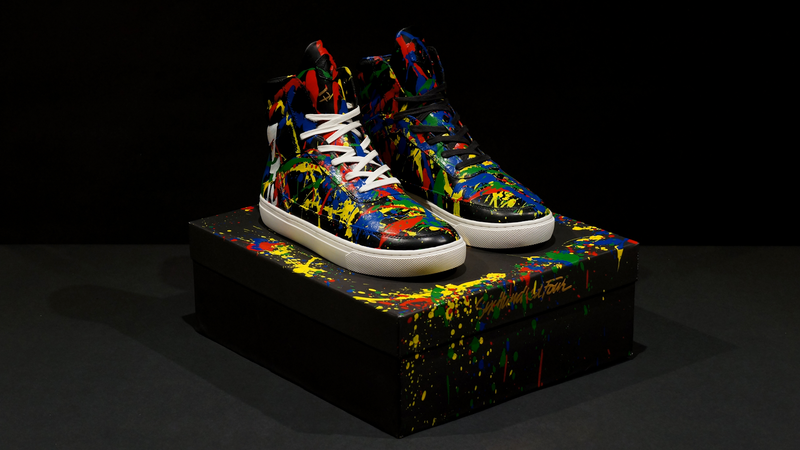 The handcrafted shoes come delivered in matching box also adorned by COLLEN’s signature Jackson style. Limited edition orders are being accepted here. Watch Phil hand-splatter paint the 30 pairs of shoes, from start to finish, in this exclusive video premiering on Ultimate Classic Rock.